Our matching algorithm computes best-fit mentors for each mentee. 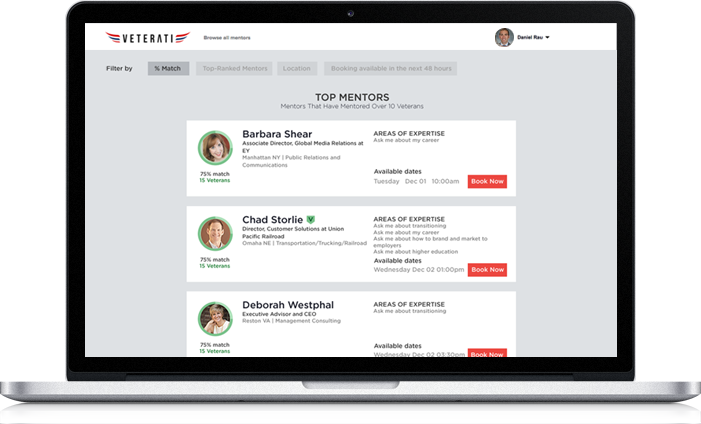 With just 1-click, mentees can book any mentor on Veterati for a conversation. Rebook, make introductions, and share feedback through our smart feedback system. 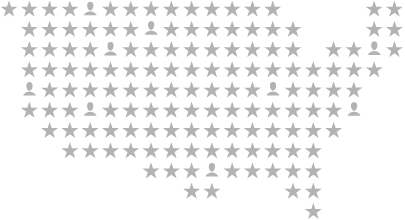 After seeing what has and hasn't worked from both sides of the traditional mentorship table, I can say with confidence that Veterati has made this process as frictionless as possible for everyone involved. At the end of the day, this is exactly the kind of fresh experience and tool our veterans need to set them up for ultimate success in the civilian world. As a mentor on the platform, I'm excited to have an opportunity to so easily give back to all those who have given so much. Veterati has been a key resource for me while I begin the transition out of the Army. The experience and diveristy of mentors and leaders that I have linked with through Veterati has enabled me to focus on areas I need to improve in to be more successful in the business world as well as opened other doors of interest that I would have not considered. Veterati is by far the best networking platform I have encountered so far in my transition. Veterati is a breakthrough in the way we help each other and communicate. As a Certified Veteran Recruiter, I spend a lot of time speaking with transitioning veterans who have a lot of questions. Through this mentorship program, Veterati gives veterans the opportunity to ask their questions and get direct, personally relevant answers. I am delighted to be involved and am spreading the word on Veterati to all I know to grow the situational awareness in the effort to help every veteran get a job. Veterati is an innovative platform that provides veterans the technological ease to seek outstanding mentorship, which normally takes years to gain. It's a great way to honor and positively influence the lives of the people that defend our freedom.